"Deliriously wild, funny and imaginative. Cantero is an original voice." --Charles Yu, author of How to Live in a Science Fictional Universe With raucous humor and brilliantly orchestrated mayhem, Meddling Kids subverts teen detective archetypes like the Hardy Boys, the Famous Five, and Scooby-Doo, and delivers an exuberant and wickedly entertaining celebration of horror, love, friendship, and many-tentacled, interdimensional demon spawn. SUMMER 1977. The Blyton Summer Detective Club (of Blyton Hills, a small mining town in Oregon's Zoinx River Valley) solved their final mystery and unmasked the elusive Sleepy Lake monster--another low-life fortune hunter trying to get his dirty hands on the legendary riches hidden in Debo#65533;n Mansion. And he would have gotten away with it too, if it weren't for those meddling kids. 1990. The former detectives have grown up and apart, each haunted by disturbing memories of their final night in the old haunted house. There are too many strange, half-remembered encounters and events that cannot be dismissed or explained away by a guy in a mask. And Andy, the once intrepid tomboy now wanted in two states, is tired of running from her demons. She needs answers. To find them she will need Kerri, the one-time kid genius and budding biologist, now drinking her ghosts away in New York with Tim, an excitable Weimaraner descended from the original canine member of the club. They will also have to get Nate, the horror nerd currently residing in an asylum in Arkham, Massachusetts. Luckily Nate has not lost contact with Peter, the handsome jock turned movie star who was once their team leader . . . which is remarkable, considering Peter has been dead for years. The time has come to get the team back together, face their fears, and find out what actually happened all those years ago at Sleepy Lake. It's their only chance to end the nightmares and, perhaps, save the world. 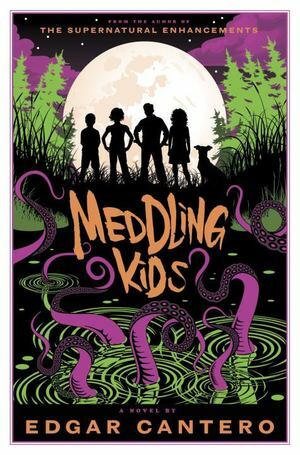 A nostalgic and subversive trip rife with sly nods to H. P. Lovecraft and pop culture, Edgar Cantero's Meddling Kids is a strikingly original and dazzling reminder of the fun and adventure we can discover at the heart of our favorite stories, no matter how old we get. A page turner for sure, but the interpretation of the beloved "gang" was disappointing. Enough to taint my childhood affection for Scooby Doo. Aside from the poor characters, the mystery was incredible with many twists and turns. The "bad guy" is definitely more complicated than someone in a mask. Probably wouldn't recommend this to someone else, but I'm not sorry I read it.